Meal planning is great for many reasons! First, it reduces stress during the week – no more walking in the door from work, and thinking “what are we going to have for dinner” – and then digging through the refrigerator trying to figure out what ingredients you have and what you can make with them. Second, it keeps you on track with eating healthier meals – if you already have the food in your house, and a plan to use it – you are much more likely to make the planned meal (which is often a lot healthier than you might come up with on the fly). Third, it helps you stay on track with your budget. When you don’t have a plan, and you are in a hurry, you may just say “forget it, let’s eat out”! Having a meal plan also helps you plan a grocery list of items that you are going to use (hopefully avoiding the pitfall of grabbing “whatever” at the grocery store – and trying to figure out how to put it all together later – and maybe not using some of the ingredients, and finding them a month later rotting in the back of your fridge – whoops). Alright, so you get it, it’s pretty great – the concept makes sense.. BUT… where do you start? 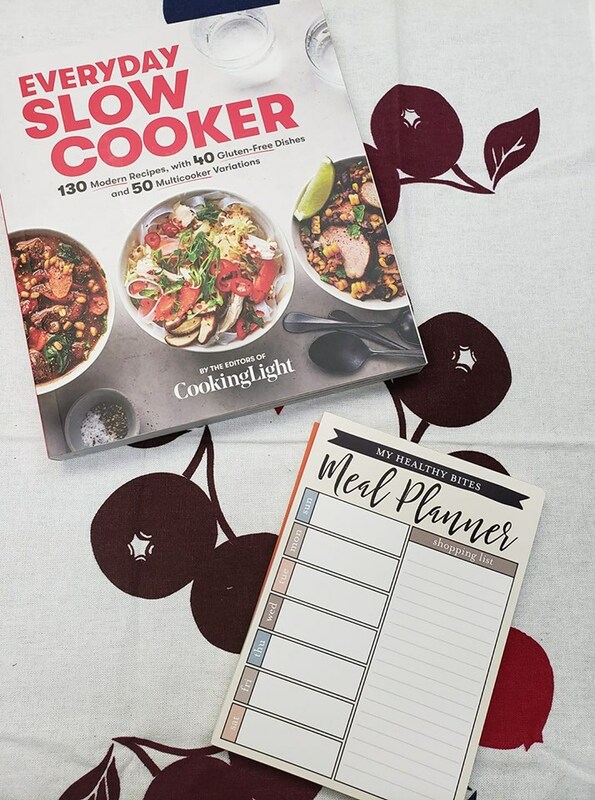 OR, maybe you have tried meal planning before – and it just didn’t work out – you planned meals for every night – and didn’t use them all – and then still found those ingredients rotting in the fridge a month later (whoops again!). That might defeat the purpose of a food budget if you are wasting food. So let’s talk about how to get started (realistically). 1. 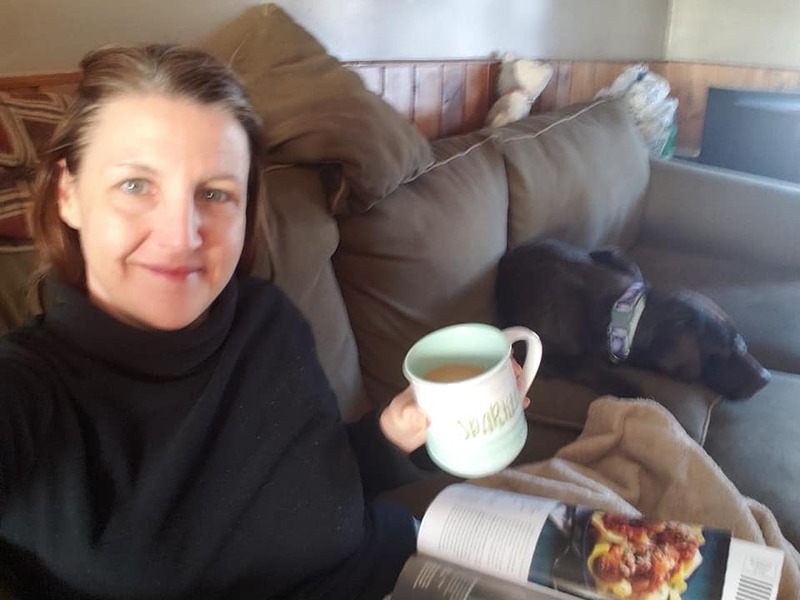 Grab a cup of coffee or tea (or glass of wine or seltzer or water– whatever you like) This is very important to enjoying this process – don’t skip it! 2. Take a look through your fridge and cupboards, and anywhere you store food – take note of ingredients you want to use up this coming week. 3. 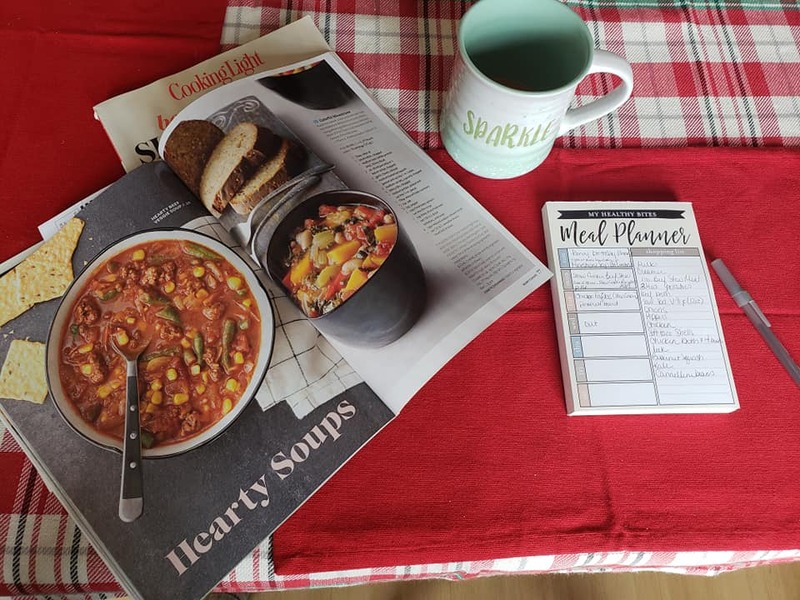 Grab a couple recipe books, recipe magazines, or your phone or tablet, something to mark pages with (I like the little sticky notes in bright colors for this). 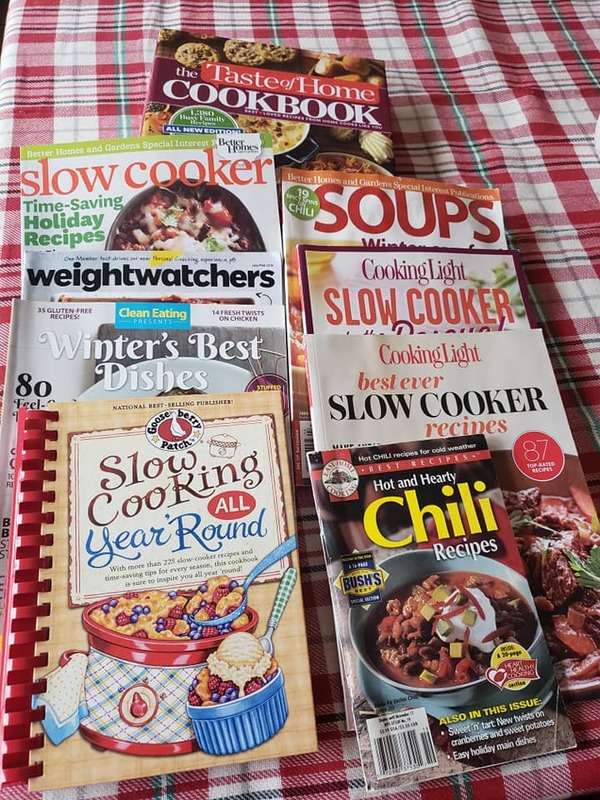 Keep it Simple: Even if you have hundreds of cookbooks and recipe magazines – just grab 2 or 3 – you can rotate them week after week – but grabbing more than this will get overwhelming. Same goes for using apps – there are tons of recipe apps – pick one to use this time (you can switch it up next time if you want, but using too many at once makes this take longer and more confusing). Pick a few recipes that look interesting, and don’t take a lot of time – mark them (either by “pinning” them, or using a sticky note to mark the page). You can “pin” recipes or mark recipes in a cookbook/magazine anytime you want – this step can be done ahead when you have more time! Techy-tip: there are some pretty cool apps for this process too. A client recently showed me an app called mealime – this will help you meal-plan (after you tell it what you don’t like, and if you have special dietary needs) –you can then pick from a bunch of 30 minute or less, fairly easy to prepare recipes, and it even creates a grocery list for you! There are tons of these meal-planning apps out there – just pick one to use for now. **If you are new to meal planning or haven’t meal planned in a while – just start with planning two to three meals for the week. You can figure out what nights it might make sense to use those meals, and plan a night to eat out, or have quickie meal at home (it gives you lots of wiggle room). I only plan for 4 nights per week (and I’ve been doing this for awhile) – that way you can eat up leftovers too. 5. Start to create your plan (my favorite meal planner tools – coming soon). Think about your week – what nights do you have things going on? Should you plan a crock pot meal for that night, or a really quick meal? Maybe that’s a good night not to plan a meal as you often eat out? It really depends on your schedule and lifestyle. If you are trying to eat out less – my suggestion is a quick meal (30 minutes or less) OR a crock pot meal on a busy night. It’s a smart idea to plan in nights to eat up leftovers (so no actual meal made). I like to write out my meal plan on a meal planner pad – but you can use a white board or another tool if you want – some people make a note in their phone. *Remember if someone else is going to help cook to write it somewhere they can see it. 6. 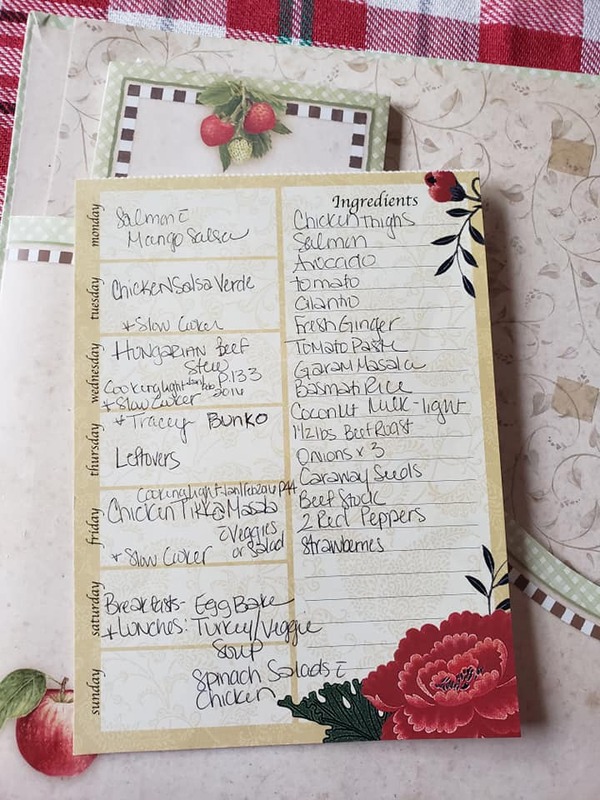 Create your grocery list (as you meal plan) – My favorite meal planner pads have a grocery list on the side – so it’s easy to do this at the same time. You can also create your grocery list in an app (like Out of Milk) – some of the apps that help you meal plan will even create a grocery list for you as you go – and allow you to check off the ingredients you already have. 7. Go Shopping – Once you have created your meal plan – check out what else you need for the week (or the next few days, or even month – however you shop). Then – head to the store. You can plan in the morning and shop mid-day, that night, the next day, a few days later – whatever works – just do it sometime before you need the food! I make my list on the meal planner – then transfer it to an app on my phone (that way I can check things off as I go). You can use a paper list too – I am just notorious for losing it on the way or forgetting it! It’s up to you! 8. *Optional – Prep part of the meals – you can chop up vegetables ahead of time. If you are doing a stir fry or crock pot meals – you can make the meals ahead in a gallon bag and put it in the fridge or freezer (depending on how soon you need it). Not every ingredient works well to prep ahead (like potatoes) – so pick recipes designed for this. I do this if I have time (and if I know my week is going to be busy, or is a recipe is going to be longer than I have time for), otherwise I may do prep the day I make the recipe. Stay tuned as we will have a blog post on prep ahead meals soon! And that’s it! You got it! You are prepared for the week ahead! Whew, what a stress relief! *I know it takes some planning to get started – but on those crazy weeknights where you are running in every direction – you will be so glad that you did!